Best known for his hit podcast, WTF with Marc Maron, Marc has interviewed iconic personalities such as Conan O’Brien, Robin Williams, Keith Richards, Ben Stiller, Julia Louis-Dreyfus, Lorne Michaels and former U.S. President Barack Obama. It has become a worldwide phenomenon; averaging 6 million downloads each month, with nearly 375 million lifetime downloads. Maron currently stars in the hit Netflix original series, GLOW, alongside Alison Brie, and his critically acclaimed half-hour scripted television series, Maron, aired on IFC in the U.S. and can be found on Netflix to stream. Marc has also performed guest starring roles in the series Girls, Louie, and Joe Swanberg’s Easy, and can be seen in the feature films Get A Job and Mike and Dave Need Wedding Dates. He released his stand-up special, Thinky Pain, on Netflix in 2013 and as an album in 2014. His next special, More Later, premiered on Epix in December 2015 and is also available on wtfpod.com. 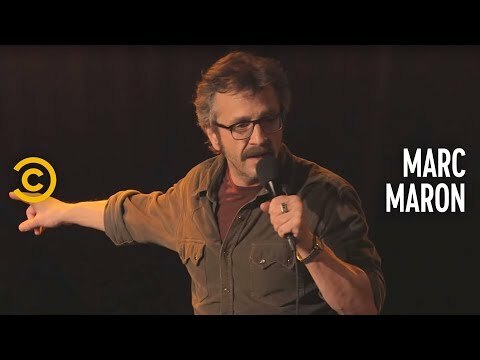 Maron’s most recent stand-up special, Marc Maron: Too Real, was released in 2017 and is currently streaming on Netflix.